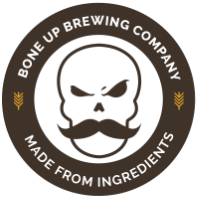 Stats: Cello - Bone Up Brewing Co.
Best Occasion to Drink: While conspiring in a dark corner of a Victorian-era pub. ...and you immediately spring to the window and throw open the blinds - this is no pub, it's a locomotive! Double crossed! Might as well settle in and get ready to tough it out, this might be a long ride.